One of BPAB's current research and development projects is aimed at increasing productivity in the wind power industry. 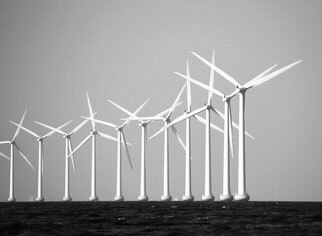 Due to that the trend in the wind power industry is increasingly turning to locate wind-power plants farther north, at higher altitudes and offshore is leading to larger problems with ice accumulation on turbines. A wind power plant's efficiency can be severely affected with icing on the turbine blades and nacelles. At worst, a turbine in cold climate can have a down-time of up to 25% due to icing on the blades. This results in very large costs in terms of loss of production. 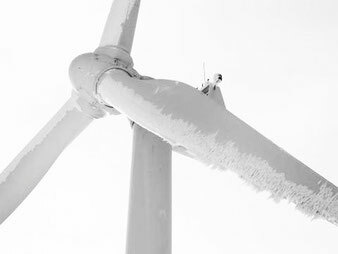 It is mostly icing aggregation on the turbine blades outer edges that will force the plant to be shut down and de-iced. In addition to loss of production, there are also severe risks of accidents with the accumulation of ice on wind turbines: service staff and others occupied in the vicinity of the turbines is in immediate danger of so-called “ice-throwing”. Ice chunks may peel off and fall down from the nacelle or ladders. BPAB's development project aims to bring forward an anti-icing technology which increases productivity and enhances security in the wind power industry. Existing methods for anti-icing in the wind power segment are often based on "de-icing" using varying methods to thaw away ice. De-icing methods firstly "allow" the occurrence of ice-aggregation. When the presence of ice is registered the wind power plant is closed down and a de-icing cycle begins which normally takes a few hours. The problem with this technique is that there is a loss of production during the de-icing cycle. On another note, they are also often quite energy consuming. On the other hand, means the presence of ice on the device a risk of damage to the equipment and personnel in the vicinity. BPAB's technology is an "anti-icing" method using high-efficiency heat by conductivity by means of fiber-composite in the turbine blades which means that the ice is actually never allowed to occur. The turbine continues to produce energy throughout the whole anti-icing cycle and in all conditions and there will be no "down time" of the wind park. BPAB's technology also means there will be no hot-spots on the blades and thus no damages such as burn-marks, as opposed to other systems. We are convinced that the use of sensor-operated conductive fiber composite is the best method against ice-accumulation in the wind power industry. Research is carried out within the framework of the Swedish Wind Power Technology Centre (SWPTC) in cooperation with, amongst others, Chalmers University of Technology (CTH) and Luleå University of Technology (LTU).